Simple & Sincere: ...And Many Mower! Isn't this a great birthday card for a guy? 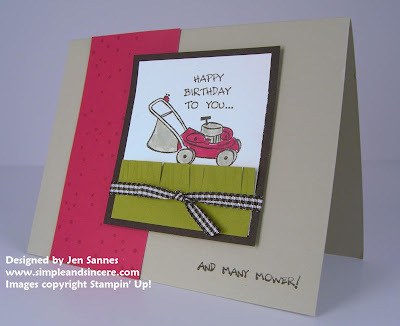 This was made using the set ...And Many Mower from the Occasions Mini, and is perfect for masculine birthday cards and Father's Day. I love the blades of grass I made using my snips - too fun! My DH does all of the mowing in our family, and Saturday marked the maiden voyage of the riding mower for the 2009 season. My kids were SO excited - they get to take turns riding with Daddy and being his mowing helper. This is my son - can you see how tickled he is? Very cute card!! Love the pic too!